Keller Williams has built a career on his uncanny ability to captivate a packed house-all by himself. So why now, after fifteen-years as a solo artist, is he releasing a live album-simply titled, Live-with three other names on the cover? It turns out that since he first picked up a guitar, this troubadour has wanted to front a band. 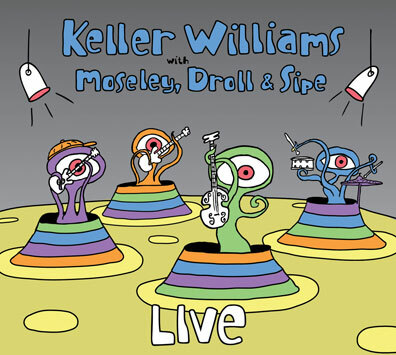 On Live (September 16, 2008 / SCI Fidelity Records), Keller taps into the world-class talent of Keith Moseley (bass - The String Cheese Incident), Gibb Droll (guitar - Marc Broussard, Brandi Carlile), and Jeff Sipe (drums - Aquarium Rescue Unit, Leftover Salmon). The musical horsepower of four friends playing together on stage proves stronger than even Keller had dreamed. Recorded at select live shows during a winter 2008 tour, and featuring seventeen tracks that span Keller's career, Live is a testament to how a band, with the right chemistry and chops, can take a song to places even the writer couldn't have imagined. "What a treat after so many years of being in control," Williams says. "The band has a knack for hanging a sharp left that I don't see coming." As the principal singer/songwriter, Keller may be driving this musical train, but he doesn't always know where it's headed. Williams puts unyielding faith in Moseley, Droll, and Sipe's ability to sustain the conversation. And, as with every live recording worth a damn, the audience is an integral part. On Live the crowd sizzles with energy; they know they're witnessing something special.